She honoured those who opened their homes to stranded passengers. 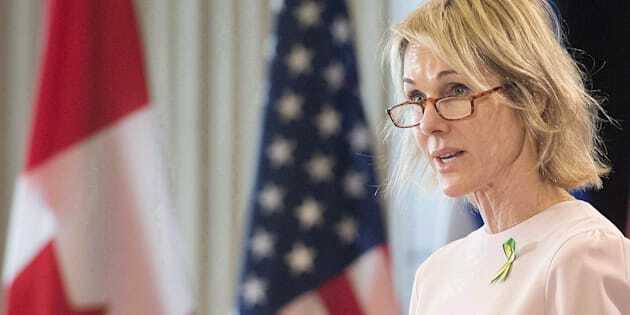 Kelly Craft, United States Ambassador to Canada, speaks to the Montreal Council on Foreign Relations in Montreal on April 17, 2018. APPLETON, N.L. — The U.S. ambassador joined the small Newfoundland community of Appleton Tuesday as it marked 9/11 with a service honouring those killed and those who opened their homes to thousands of stranded passengers. "Forget what you read about NAFTA negotiations and Twitter wars, that's not who we are," Craft said in her prepared remarks, referencing the nations' ongoing trade spat and President Donald Trump's jibes against Prime Minister Justin Trudeau. "Sure, it's business and it's important, but Gander is the place that — in a snapshot — illustrates the Canada/U.S. relationship." Derm Flynn, who was Appleton's mayor at the time, said he was feeling melancholy Tuesday as he reflected on the intense days 17 years ago when 38 wide-bodied jets carrying about 7,000 passengers arrived nearby at the Gander International Airport. "When everyone started calling for volunteers, everybody was there to help out," Flynn said in an interview, moments before the annual service got underway. "And as a result of 9/11, we got to meet some wonderful people and became friends with a number of them." In her prepared remarks, Craft said she couldn't resist accepting the invitation to visit Appleton and Gander, about 20 kilometres apart. "Today, on this day in particular, there is no place I would rather be," she stated. "Gander will go down in history as being the place that embodies the meaning of friendship and humanity." Flynn's family was one of the many that welcomed stranded passengers into their homes, offering food, housing and comfort to people who, at the time, were suddenly stuck indefinitely in an unfamiliar place. "I guess it was a great comfort for them knowing they were on the ground in a place where they were being taken care of and for us it was the knowledge of being able to do something for somebody in need," he said. "Hospitality came through that day in the form of soup and sandwiches, a bunk to sleep on or a bed to sleep in at somebody's house and a warm hug and embrace to comfort them in their time of need." Much of that was captured in the now-famous Broadway production, "Come From Away." Flynn himself is portrayed in the musical and is also featured in a new documentary airing Tuesday night on HBO, called "You Are Here: A Come From Away Story."